PEGGED! 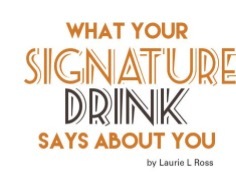 What Your Signature Drink Says About You. Article starts on page 175 FRESH INK! While you may order many different drinks over the course of your life, there will always be that one to fall back on. Your signature drink. Just like your car or your go-to karaoke song, it says something about you. 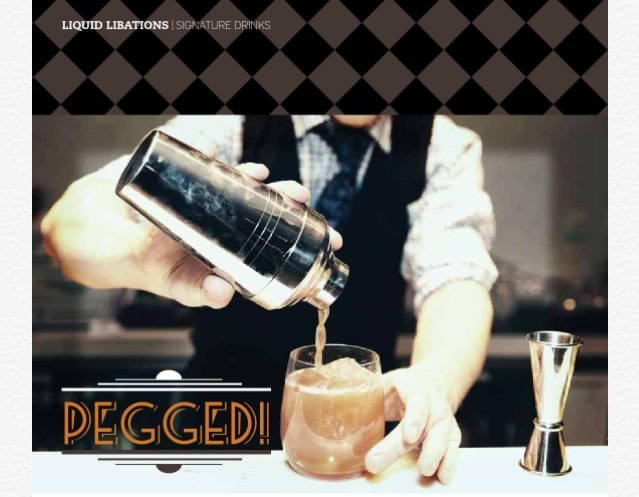 To help you identify your perfect signature drink, we have paired a number of libations and the characteristics they may portray. Domestic Beer: Boring can be viewed as dependable. It’s all about the way you look at it. If this is your signature drink, you’re loyal and not trying to impress anyone. You like rock or country, but alternative music is foreign to you and you’d like to keep it that way. Domestic beer is safe and predictable, just like you; however, you may risk missing out on adventure. Imported Beer: Sadly, you think you’re better than the domestic beer drinker. Essentially you’re not, but you pay more for your beer. You fancy yourself interesting and worldly even if you haven’t ventured out of the Pacific Northwest. Often the imported beer drinker doesn’t really think it’s better, especially after a few, but they don’t want to be perceived as boring. So they pay a little more. Microbrew: You think outside the box and don’t adhere to the status quo (at least that’s how you perceive yourself). Maybe that’s true. Your dream is to own your own microbrewery. You like indie music and bands that don’t get airplay. You see yourself as really interesting and throw out beer terms to prove you really should own a brewery. You’re comfortable with your income status and look for those who appreciate strong or hoppy beer like you do. They’ll be your future business partners. But, you’ll spend more time researching/drinking than actually writing a business plan. That’s okay— at least it makes you feel productive while drinking beer. Blended Strawberry Margarita: If this is your signature drink, you’re most likely a girl. Let’s be honest, you don’t really like the taste of alcohol but you like to fit in and look like you know how to have a good time. They go down like a Slurpee and before you know it, your dance moves are as loose as your lips. You quickly call your friends the next morning to recap and quite possibly apologize. Scotch: Young scotch drinkers are attempting to make a statement even if they have to drink something they are still trying to acquire a taste for. Older scotch drinkers are charming, refined and know their limits, but aren’t above drinking games. As scotch is not a spirit that most people start out liking, you are most likely persistent. Because of this, bartenders respect you. Wine: It really depends on the wine, but many wine drinkers are okay with being known as the classier-than-others wine snobs. They enjoy name-dropping labels, throwing out weird wine lingo and therefore feel rather fancy. White Zinfandel means you’re new to wine. You don’t know what to order but like the idea of drinking wine, even if you don’t find most wines drinkable. Many wine drinkers often start exclusively with white and then graduate to exclusively red. But the sophisticated palate then rediscovers interesting whites as well and switches it up depending on the region or pairing. The true wine lover may break out the Platinum Amex for a good bottle, but could also get excited to find affordable, quality wine that may be indulged daily. They also like the thrill of discovering an up and coming winemaker that no one knows about….yet. Wine drinkers are thinkers with depth, and though they have a casual approach to wine, they are still pretty serious about it. Vodka Cranberry: Again you don’t really like alcohol, but don’t want to be left out. You lack imagination and possibly have a fake ID on you. Martini: You may truly be classy, but there’s a good chance you’re a fake and want to be perceived as a VIP of some kind. You can tell the difference by the way a martini is ordered. The true giveaway that you’re a poser is the James Bond line of ordering a martini: “shaken, not stirred” as well as being disappointed if it doesn’t come in the v-shaped glass so everyone knows what your drinking as you hold the glass high for all to see. The refined martini drinker doesn’t drink it for show and truly cares about the details, from the particular spirit to the garnish. Rum & Coke: You are basically the hard liquor version of the domestic beer drinker. You’re traditional and again, that can be a good thing. It may have been your first mixed drink and darn it, you’re sticking with it. Gin & Tonic: You’re clean, crisp and straightforward. An older relative most likely drank this in front of you when you were a child and you decided it was still refreshing, but grown up. Either that, or you fancy yourself with a place at the lake and it’s a drink you can slowly sip all day. Old- Fashioned: You’re a throwback to a simpler, rustic time. But you’re also modern, yet sensible. You really like the taste of bourbon any which way it’s poured. You may like a twang in your country music or go for jazz and blues. Mint Julep: You’re a Southerner…or at least you want to be one. You’re fancy and maybe over-accessorized right down to the greenery in your glass. You love the Kentucky Derby and seek smooth comfort in your glass. You don’t slur when you order, but have been known to adopt a Southern drawl. Long Island Ice Tea: You like variety and have a taste bud for every type of liquor. You’re a risk taker because if you have more than one you are likely to make a poor decision. You’re really okay with that. You long for a tropical vacation and an umbrella in your drink. Jack Daniels: Well, you definitely like to have a good time no matter what. You like classic rock, some country and don’t care what others think. You’re honest to a rebellious fault and may be looking for trouble. Whiskey girls are party girls that can drink with the boys. When Sweet Home Alabama is played in the bar you act like it’s your anthem— even if you’ve never been south of Colorado. Oh, and Sundays are about NASCAR. Tequila: There are two types of tequila drinkers. The first one is throwing back shots. The goal? To get drunk. Let’s face it— this drinker just wants to be reckless and then blame it on the alcohol. Do you not know your friends are getting tired of taking care of you? The second tequila drinker is a true connoisseur of the Mexican spirit and can slowly sip it without showing any of its potent effects. To this drinker, the brand matters. It’s pretty easy to discern these two tequila drinkers from each other. If you’re still in search of a go-to drink, consult a good bartender who can, over several visits, take you through the classics, as well as introduce you to some new concoctions. And if you don’t like what your signature drink “says about you,” speak up and prove your libation companions wrong! 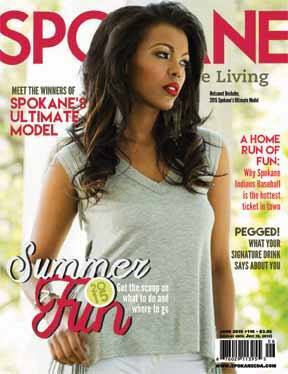 Laurie L. Ross is the author of Sip of Spokane, the popular local wine blog, www.sipofspokane.com.